The Artistic Directors of Boston's renown "Lucky Ten" Young Talent Studio are pleased to offer two-week summer session for children and teens, ages 7-16. The session will culminate in a showcase performance for the entire family. 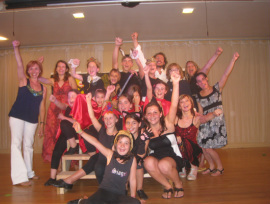 Children will be taught by specialists in vocal arts, tap, acting, and stage presence. We feel this blend of training will provide the most complete and positive experience for each child. to reserve a spot for your child.